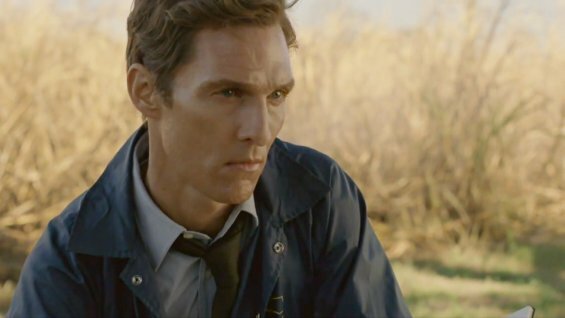 If you haven’t seen True Detective yet, you owe it to yourself to address that. Don’t have HBO? Whatever. Find a friend with an HBOGO account. Find a torrent. Sign up for one of those cable promos they’re always offering and then cancel it when you’re done. I don’t care; just do what you have to. OK, if you STILL haven’t watched it, I’ll keep this spoiler-free. But just know that there’s nothing I can say that will convince you more than just watching the first episode. This show gets its hooks in you quick and never lets go. Rust Cohle and Martin Hart are cops on a 17-year quest to catch a serial killer in southern Louisiana. That’s about all you need to know about the plot going in. I don’t want to spoil the wonderful way it spools out through the 8 episodes. It’s Matthew McConaughey and Woody Harrelson’s instantly iconic characters that draw you in. Rust is the ultimate eccentric skeptic genius. There are shades of Spock, Locke*, and Sherlock**, but that doesn’t even begin to describe him. Ultimately he’s all McConaughey – another knockout performance in his recent “McConnaissance” win streak. This may have even influenced his recent Oscar win; several episodes aired during the voting period. Even if it didn’t, the last scene of the final episode proves how much he deserves that trophy. Harrelson, meanwhile, has been having his own “Harrelssance” of sorts. (Check out most of his work since 2009’s The Messenger.) In less deft hands, Hart could be a thankless role: the straight man to counter all the crazy. But Woody reveals a man in many ways as damaged and destructive as Rust. As the title suggests, classic tropes of true crime and murder mystery figure heavily into the narrative. But the genre is a structure. It sets the stage for a masterful script that will surely inspire not just filmmakers and storytellers, but modern day philosophers for a long time to come. As fantastic as the actors are (and all the actors are fantastic, not just the leads), they have the benefit of expertly constructed characters to start with. The dialogue, though often hard to understand (watch with subtitles if you can), is stunningly crafted and infinitely quotable. The technical crafts are top form as well. The cinematography is gorgeous. The soundtrack by T Bone Burnett is haunting. And from Cohle’s sparse apartment (complete with an eyeball-sized mirror) and surprisingly arranged storage unit, to the house of a demented hoarder and an overgrown labyrinthine fortress (of sorts), the set design is truly inspired. But the real genius is that, while it transcends its genre trappings, this show never becomes so arty that it loses sight of what makes that genre so enjoyable. As dark as it gets – and make no mistake, it gets pitch black at times – it never loses that feels of excitement and anticipation and, dare I say it, yes even fun. As I write this review it occurs to me that most of it could be used to describe another groundbreaking TV show about a murder mystery from almost 25 years ago. Actually they don’t feel all that similar. True Detective eschews the soapy melodrama that Twin Peaks revels in, and ultimately I think the newer show is a bit more accessible. But lined up side by side, there are surprising similarities.